Who insist on pushing forward and being right. That mirrors the steps backward. In Brazil, the collapse of the dam at Córrego do Feijão Mine in the city of Brumadinho (60 km from Belo Horizonte, the state capitol of Minas Gerais), brings to light once again the tragic human and environmental impact of mineral exploitation of financial capitalism. Since January 25, the world has witnessed scenes of devastation and violence caused by heavy iron ore waste in the form of a toxic mud. Just a few minutes after the dam at Córrego do Feijão collapsed, 12 million cubic meters of mud were dumped into the Paraopeba River’s drainage basin, covering everything in its path. According to Brazilian Institute of Geography and Statistics (in Portuguese, Insituto Brasileiro de Geografia e Estatística - IBGE), the main economic activities of the city of Brumadinho, with almost 40 thousand inhabitants, are the exploitation of ore as well as agriculture, livestock and tourism. The region is rich in natural, cultural and historical heritage, such as the Rola Moça Park, the Inhotim Institute and the Sapé Quilombo. The Affected by Dams Movement (in Portuguese, Movimento dos Atingidos por Barragens - MAB) fears that the mud will reach the ocean through one of the main rivers of the country, a tragedy that occurred during the Mariana dam disaster. 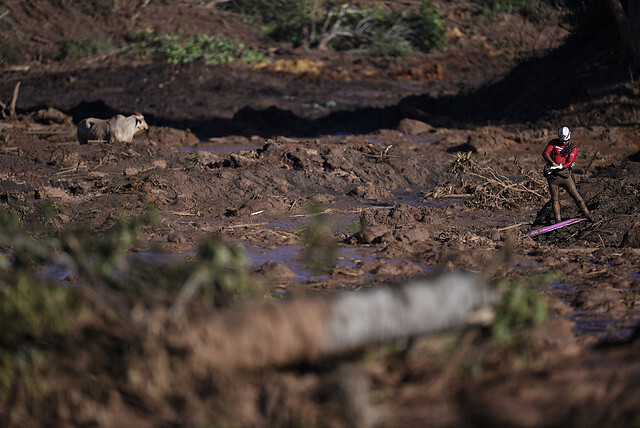 The ongoing deluge of mud is spreading through the drainage basin of the Paraopeba River, an important tributary of the São Francisco River that passes through the state of Minas Gerais and other five states in the Northeast. If nothing is done, 521 Brazilian cities may be affected. There are already dozens of confirmed deaths and it is estimated that 300 people are missing – a number that could potentially double. The collapse of the dam occurred at lunchtime during a shift change. The Córrego do Feijão Mine operated in three shifts, 24 hours a day, 7 days a week. It is significant to note that the break room is located below the dam. Vale and subcontracted workers were eating, recharging their energy to continue selling their labor to the mining company when they were surprised. Things changed quickly. Workers who has paused for lunch from a hard day’s work to regain their energy were suddenly swallowed by the insatiable dam’s appetite and covered in mud that descended upon them, destroying everything in its path. This large-scale disaster provokes even more outrage because of the company’s track record and impunity. The same company, Vale, the world's largest iron ore producer, was also involved in the Mariana dam disaster and the collapse of Fundão dam in 2015 in the same state of Minas Gerais. It led to the leakage of more than 43 million cubic meters of waste, causing 19 deaths as well as the contamination of Doce River and the ocean. Vale was also involved in the leakage of a dam in Barcarena, in the state of Pará (northern Brazil) in February 2018. It is not possible to understand the capitalist development in a country with a colonial inheritance like Brazil without understanding the role of mining activity. The “Gold Cycle” began in the late 17th century and expanded throughout the second decade of the 18th century, when mining became the most important economic activity of the colony, replacing the “Sugar Cycle”. Likewise, in the 19th century, mining lost its place to the production and export of coffee in accordance with the development transformations of global capitalism and its demands for capital. Vale do Rio Doce Company (in Portuguese, Companhia Vale do Rio Doce – CVRD)—founded in 1942—has been a part of capitalist development as well as the national development project in Brazil since the 20th century. In the 1970s, the company consolidated its position as the largest exporter of iron ore in the world, a position it continues to hold today. In 1995, in the midst of the advance of neoliberalism in Brazil, President Fernando Henrique Cardoso included Vale in the National Privatization Program. On May 7, 1997, the company was privatized and purchased by a consortium led by the National Steel Company (in Portuguese, Companhia Siderúrgica Nacional - CSN), another formerly state-owned company that was privatized in 1993, which acquired 41.73% of the common stocks from the federal government for US $3,338 billion. In 2003, Vale had the highest net income in its history: US $1.23 billion, earning in one year the amount paid for its acquisition in the privatization auction. In the same year, there was also a jump in the privatization of the company; 67% of Vale’s stocks were traded on the New York Stock Exchange, while only 33% of the stocks were traded in Brazil. In January 2013, the company’s value surpassed the $100 billion threshold. In other words, in just a decade its value multiplied by ten, demonstrating that the price of the auction had been undervalued; after the auction, the market adjusted to the real value. The process of privatization and the denationalization of Vale is emblematic of the neoliberal project in Brazil. There was no record of tragedies such as Brumadinho while the company was state-owned. When Vale was privatized in the 1990s, the price of iron ore in the international market was, on average, US $30 per dry ton. Within the logic of financial capitalism, iron ore was transformed into a mineral commodity and, since the 2000s, prices have skyrocketed due to the high demand for mineral commodities and the Chinese investments in infrastructure. Mining in Brazil went through a phase of rapid expansion: between 2003 and 2013, minerals increased from 5% to 14.5% of total exports. Due to this commodities boom, it became viable to exploit several mineral reserves, sparking an accelerated expansion of mining activity in several areas that had previously not been attractive. This led to an increase in the installation of dams without abiding by the necessary precautions required under current laws. With the sharp decrease of mineral commodities prices in 2011, we witnessed the end of the commodities boom period. Some of the factors that led to this were the excessive supply of some minerals, the decrease in demand of most minerals, the prospect of low prices in the medium term, corporate indebtedness, and operational and financial results pressured by the deficit, among other reasons. As a result, in order to compensate for the drop in economic surplus due to low ore prices, mining companies have sought gains in production scale by passing on losses to the workers, the community, and the environment, and by cutting costs with security and monitoring. In order to understand Vale’s crimes in Brazil, it is necessary to consider this dimension of increased exploitation and the offensive against natural resources that is intensified by the global capital crisis in an attempt to regain the world rate of profit through predatory activities. Tailings dams are used to store the waste produced during the extraction of iron ore after the economically valuable material (iron ore) is separated from the minerals with no market demand. The dam of Córrego do Feijão Mine that burst in Brumadinho used the upstream system, which increases through tiers (usually in the form of steps) – called raising (or elevation) – made with the same tailings that results from of iron ore beneficiation. This is one of the cheaper techniques to store the tailings of the mining process. It is also one of the most dangerous techniques. With the increase in ore production, and to compensate for the lower prices on the international market, the production process is subject to a higher level of pressure than projected. The dam, which was built in 1976, was “disabled” for three years but contained 13 million cubic meters of sludge, a result of mining activity. The mine has a complex of 13 dams and produced 26.3 million tons of iron ore in 2017 alone, almost 7% of Vale’s production, according to company information. The National Mining Agency, responsible in Brazil for the licensing and control of part of the facilities, confirmed in a statement that Vale had obtained “control of this dam by an independent entity last September”. According to this diagnosis, the dam presented a “low risk of collapse” but a “strong impact” on the environment in case of an accident. However, the “independent entity” cited by the company is a design office that often works exclusively for Vale and whose independence is regularly questioned by scientists. The economic weighting of the mining giant in the region is another decisive factor in granting licenses. The Minas Gerais Environment Secretariat met on December 11, 2018 to review a new production license for this mining complex. The report of the meeting, released by the Brazilian press, reveals that the possibility of a collapse on the containment wall was mentioned by the head of Ibama, the government agency that also controls the mining facilities, and by the representative of civil society, who was the only one to vote against a new license. There is ample evidence that Vale was aware of the instability of the dam, yet they negligently took the risk to continue their plans to mine the dam. After the crime committed in Brumadinho, Vale announced the decision to stop operations of ore exploitation and dismantled ten dams that use tailings storage method similar to the Córrego do Feijão Mine. What is happening in Brazil and Latin America is occurring in the context of a global crisis of capitalism where the State is sequestered to serve the interests of new cycle of capitalist accumulation. Of the 24 thousand dams in Brazil, 40 of them may be in a critical condition. The National Policy on Dam Safety was created in 2010 under Lula’s government. But today roughly 42% of the dams do not have any type of legal regulation– such as permits— , putting lives at risk. On January 29, five engineers who have civil liability to respond to the dam’s inspection received an arrest warrant. However, the responsibility of the company and of the State cannot be concealed. Another important dimension regarding the collapse of Brumadinho dam is that Vale must respond to legal cases due to work-related injuries in addition to compensation for affected families and environmental fines. Unfortunately, the Labor Reform approved by the Temer administration makes it more difficult for workers and their families to receive compensation for work-related accidents or death. In November 2015, Samarco tailings dam, a joint venture of Vale SA with Anglo-Australian BHP Billinton, burst in the city of Mariana in Minas Gerais, killing 19 people, destroying a whole village, affecting thousands of coastal residents of the Doce River, and contaminating hundreds of kilometers. The collapse was criminal; those responsible hired unskilled labor, built the dam in the cheapest way possible without taking the necessary precautions, and knew of the imminent risks. After 3 years, no one was arrested and only one of the 14 workers who collapsed along with the dam was compensated. These collapses are a result of decisions made during the production process and should be addressed. Nevertheless, this would mean correcting the production process of hundreds of dams across Brazil and would cause huge losses to the company’s profits. For this reason, Vale has constantly refused to engage in dialogue with employees, further demonstrating their complete corporate irresponsibility and their insensitivity to people’s lives and the environment. The dam workers, who know the ins and outs of the production process and are therefore among the best inspectors, have denounced the situation, but the company’s response was the refusal to recognize unions representing the workers. For this reason, ICM, along with IndustriALL, filed a complaint with the OECD against Samarco (Vale-BHP Billinton) to promote social dialogue, but it was shamelessly rejected. As we can see, the State is sequestered by the interests of private capital against the rights of the people and the interests of the Nation. It is not yet possible to measure the scale of the environmental impact of the crime committed by Vale. According to reports by the National Water Agency, the sludge containing mining waste that has spread along the Paraopeba River – which traveled 46 km from Friday to Sunday – is heading towards the Retiro Baixo Hydroelectric Power Plant in Pompeo (310 km from Brumadinho). It could reach the São Francisco River basin in the region of Três Marias hydroelectric dam—500 km of destruction— compromising the life of indigenous villages and peasant families and the water supply as well as affecting the local relief and the course of rivers. Despite all of the environmental and social destruction caused by this crime, so far Vale has presented no plans to contain the mud and has shown no interest in stopping its exploitation of ore.
President Jair Bolsonaro (PSL) even stated during the campaign that he intended to end “radical environmental activism.” This crime occurs at the same moment that Bolsonaro says there is an “environmental fine industry,” questioning the need for a public agency such as Ibama - Brazilian Institute of Environment and Natural Resources. A concrete example is the 3.729/2004 Bill that changes the rules of environmental licensing in Brazil and unfairly favors the participation of certain actors in the decision-making process, valuing the role of entrepreneurs over the participation of the affected populations. The environmental issue is also a political issue that can only be solved by achieving a sovereign mining process in Brazil. The way the mining activity is organized must be the result of a democratic processes based on popular sovereignty. In Brazil, the Affected by Dams Movement (in Portuguese, Movimento dos Atingidos por Barragens – MAB, created in 1991) and the Movement for Popular Sovereignty in Mining (in Portuguese, Movimento pela Soberania Popular na Mineração – MAM, created in 2012) organize populations affected by dams. They also propose measures that reinforce popular sovereignty in mining, such as: the regulation of scales and rates of mineral extraction; the possibility of creating free mining areas according to the will of the populations, the creation of incentives for cooperatives and artisanal mining instead of stimulating multinationals, the expansion of inspections and monitoring the capacity of the State apparatus, the possibility of expropriation of the assets of the companies that could be directly managed by the workers themselves, incentives for economic diversification of mined regions, and the creation of local/municipal deliberation channels of popular control over mining. These movements systematically denounce the three years of impunity since the Mariana dam disaster and are organizing the communities and workers in Brumadinho in a unified action plan of Brazil Popular Front (Frente Brasil Popular – FBP). International solidarity is crucial to help denounce Vale’s irresponsible actions and to pressure those who are responsible for the tragedy to be identified. On January 31 (the seventh day since the tragedy) and February 1st, the Brazil Popular Front called for a demonstration for the right to bury our dead. It is also very important to call for an international day of action that denounces the violation of human rights in Brazil on March 14, the national and international day of struggle against dams, for water and life, and the day of the murder of Marielle Franco. Vale’s mining operations impact communities in many different countries. Only organized workers can win justice to this crime. It was not an accident, it was a crime. Who will pay more for Vale’s stocks? Than to wait for the day to be buried. Vale does not value a single life lost!